NASA's Curiosity Mars rover has sparked the curiosity of the media and the blogosphere, with widespread speculation as to whether one of its laboratory instruments has made a major discovery in the quest to find out if the red planet ever hosted a habitable environment. NASA officials, however, are downplaying the speculation, saying the results, expected to be presented Monday at the American Geophysical Union's fall meeting in San Francisco, are scientifically interesting, but not in and of themselves "earthshaking." "The rumors about what the results are from the SAM instrument on Curiosity are quite overblown," Guy Webster, a spokesman for the Jet Propulsion Laboratory in Pasadena, Calif., told CBS News Wednesday. "There's nothing earthshaking. The news conference next week will be one in a series trying to keep people up to date about the rover's progress and findings." For his part, John Grotzinger, the Mars Science Laboratory's project scientist, won't talk about whatever the rover has discovered, telling reporters the science team wants to make sure the data are fully understood and that no mistakes are made interpreting the results. That's not unusual, researchers say, and reflects sound scientific practice. But when it comes to speculation about life on Mars, rumors can be hard to avoid, especially when the data are from an instrument designed to look for the carbon compounds essential to life as it is known on Earth. The instrument package in question is known as SAM, which stands for Surface Analysis at Mars. The compact laboratory, about the size of a microwave oven, uses a mass spectrometer, a tunable laser spectrometer and a gas chromatograph to look for organic compounds in samples of the red planet's soil and atmosphere. Two small ovens are used to heat samples to some 1,800 degrees Fahrenheit. The mass spectrometer can detect nitrogen, phosphorous, sulfur, oxygen, hydrogen and carbon and other elements. The tunable laser spectrometer measures concentrations of methane, carbon dioxide and water vapor, along with various isotopes. The gas chromatograph identifies organic compounds using a different technique. SAM's first soil sample, collected from a sand dune in an area near Curiosity's landing site known as Glenelg, was processed about two weeks ago. At that time, deputy project scientist Ashwin Vasavada said the SAM team decided to repeat the sample run based on a quick-look assessment. "Based on a very brief look at that data, the team decided to run a couple of more SAM experiments, which are customized to this particular soil and we're currently in the midst of getting those results back," Vasavada said. Reporters assumed the team found the initial data suspect for some reason. But no one asked any follow-up questions about the additional sample analysis. Curiosity landed in Gale Crater on Aug. 6 to kick off a planned two-year mission. The initial months of the mission have been devoted to checking out and calibrating its scientific instruments before the rover makes its way to its ultimate target, the base of a central 3-mile-high mound of layered terrain known as Mount Sharp. For the past several weeks, Curiosity has been working at the Glenelg site where orbital photographs show three types of rock and soil coming together. Most recently, the rover's robot arm has been put through its paces scooping up sandy soil samples from low dunes and depositing them into a pair of on-board mini laboratories, SAM and another known as CheMin, for Chemistry and Mineralogy. 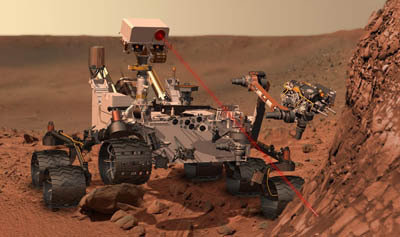 The rover recently moved to a new area, known as Point Lake, while the team looks for suitable rocks to serve as test subjects for a powerful drill mounted on Curiosity's robot arm. The drill, intended to provide pristine samples from the interior of targeted rocks, is the final major component of the science package to be tested. The nuclear-powered rover was not designed to look for signs of past or present life. Rather, its instruments were built to look for the chemical traces of past or present habitability. SAM plays a central role in that quest as it looks for organic compounds that are essential to life as it is known on Earth. As such, rumors about a significant discovery in the SAM data triggered widespread interest, prompted in part by a National Public Radio story last week that raised the possibility of an "earthshaking" result. Since then, project officials at JPL have been bombarded with media queries. Webster says the results Monday will be "interesting" and "not insignificant." But he warns they likely will not live up to uninformed speculation. Curiosity chimed in last week, saying on its JPL-authored Twitter feed (@MarsCuriosity): "What did I discover on Mars? That rumors spread fast online. My team considers this whole mission 'one for the history books.'"